“She has come there as a professor to teach the little visionaries … ” – Pope Benedict XVI. Our May issue of Intercom magazine is now available. 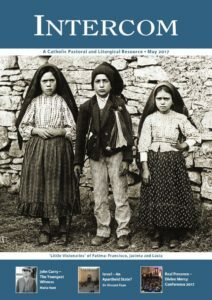 This month’s cover shows the ‘little visionaries’ of Fatima, Lúcia, Francisco and Jacinta. As we enter May, the month of Mary, the latest issue of Intercom highlights the ‘little visionaries’ visited by Mary in Fatima 100 years ago this month. We also feature the story of John Curry, the youngest witness of the apparition at Knock Parish Church who will be re-interred to Old St Patrick’s Cathedral in New York, during a historic pilgrimage from Knock Shrine to New York. Other highlights in our May issue of Intercom include a reflection ahead of Vocations Sunday from Father Willie Purcell, National Vocations Coordinator; a focus on the Maynooth Legion of Mary who celebrate their 40th anniversary this month; and an article by Sir Vincent Fean on the ongoing division in Israel; along with our usual prayers, reflections and resources for the month of May. Click here to view the contents page of our May issue. Click here for Newsletter Resources, Resources for Family Mass and Irish Mass Notes for May. Intercom is a pastoral and liturgical resource magazine published by Veritas Group, an agency of the Irish Catholic Bishops’ Conference. The editor of Intercom is Father Paul Clayton-Lea and the editorial team is based in the Catholic Communications Office in Maynooth, Co Kildare. Intercom is published ten times per year, including double issue for both July-August and December-January. There are two ways to subscribe to Intercom. For information on online and digital subscription click here. Alternatively, the membership secretary, Mr Ross Delmar, can be contacted at Veritas House, 7/8 Lower Abbey Street, Dublin 1, by telephone +353 (0)1 878 8177, and by email ross.delmar@veritas.ie. Current subscribers can contact the membership secretary to gain full access to the website.